Norwegian painter Edvard Munch is one of those artists that few people who have not taken a specific interest in art history tend to have heard of, but whose work just about everyone knows, or at least one specific piece of it. We're talking about The Scream, of course, also referred to as The Shriek, an iconic work in which the anxiety of a screaming woman spills out into the distorted landscape that surrounds her. It's a painting that's found its way into the public consciousness through its absorption into popular culture and continues to do so – the face became the instantly recognisable Halloween mask in Wes Craven's 1996 Scream, while the painting and even its central character have both been featured in Simpsons episodes. The fame of that image alone might suggest that its creator was a successful and wealthy man, but in the manner of artists breaking new ground in years past, nothing could be further from the truth. Munch painted and Munch exhibited and the public and critics hated what they saw, and I'm not talking once but every time he tried, over a period of many years and canvasses. When most would have given up, Munch just kept on developing his art in his own non-conformist style, and yet every time he showed his work it was slated, often with extreme hostility. In Berlin an exhibition of his work was forcibly closed just days after it opened, so outraged were the establishment by the "anarchistic smears" that were contained within. So what was the horrible crime against art that Munch's paintings were committing, that so offended the eye of so many beholders? Well, it was quite simple really – it was new. Munch had chosen to reject established naturalism in favour of a style that reflected not just what he saw, but how he reacted to it emotionally, psychologically. This approach was later to attract a number of practitioners and eventually find itself a name: Expressionism. My own relationship with Munch's work goes back a fair few years, and The Scream wasn't the first Munch painting I saw. Arriving at his work through art history classes, my introduction to the artist was his 1894 painting The Vampire and the 1899 The Dance of Life, both of which I adored. He was the first artist – and Expressionism the first art movement – that I bought books about. The works of Munch and the later Expressionist artists made immediate sense to me, both as art and a personal reading of reality. I was also soon to realise that this approach translated beautifully to film, something 1920s German cinema in particular was quick to understand and employ. 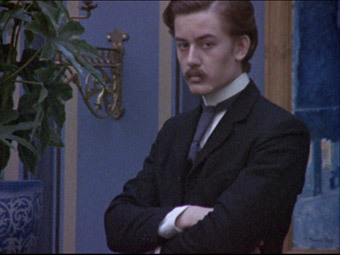 I've known for years about Peter Watkins' biographical film on Munch but have never managed to track it down, despite the considerable praise it has attracted over the years. A cynical part of me couldn't help wondering if that praise was so enthusiastic precisely because the film was so hard to see, that strain of critical snobbery that likes to suggest it knows something that you never will. Then again, I've yet to see a Peter Watkins film that hasn't left me reeling – Culloden, The War Game and Punishment Park are all high up on my list of films everyone should see before they die, and the prospect of one of my favourite painters cinematically profiled by one of my favourite directors was an enticing one. Those familiar with Watkins' cinematic style will immediately find themselves at home here. This is a drama documentary with the emphasis on the latter – were it not for the period in which the extensive re-enactments were set, you could almost swear Watkins had been there with his camera to record events as they occurred. Family life and social activities are patiently observed, with characters intermittently acknowledging the presence of a camera that will hurriedly reframe or struggle to focus, while many of them are interviewed by an unseen but intermittently audible reporter. This sense of reality is enhanced by performances that are so natural that it's almost detrimental to classify them as performances at all, an affect achieved by casting non-professionals and allowing them to express their own views in their own way (their resulting modern accents and expressions were apparently a target for criticism on the film's initial Norwegian release, which I think is a little picky and somewhat missing the point). 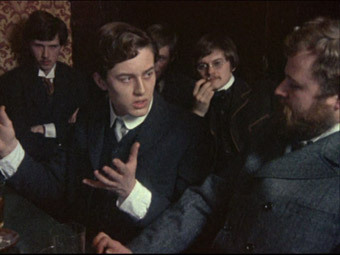 The narrative is constructed around readings from Munch's diary, written sometimes in the third person, and a sober BBC-style voice-over that provides us with detailed information on the lives of Munch, his family and his associates, particularly the café revolutionaries who made up the Boheme, a well-intentioned but largely ineffective group whose contempt for established attitudes and religion I nonetheless found endearing. Relationships embarked on by Munch and his compatriots receive particular attention, especially Munch's involvement and post-breakup obsession with the woman he records in his diary as Mrs. Heiberg, the sort of self-destructive hopeless cause that always makes me want to slap some sense into the unfortunate victim. For Munch it proved fateful, tarring his personal life with the same level of disappointment and anguish that public and critical reaction did to his career. If you're looking for a definition of both tortured artist and driven visionary, then Edvard Munch is your man. If this was the extent of Watkins' reworking of biopic conventions then it's doubtful the film would have attracted the acclaim it has, but these are the foundations on which he builds a far more complex and layered work. Right from the start he establishes a socio-political element, counterpointing the superficiality of the middle-class promenade with an interview with a working-class family, while the narration highlights the grim conditions and prospects for those at the bottom of the social ladder. Dates are contextualised through significant events of that year, a painting by Van Gough or a novel by H.G. Wells always balanced with news of militaristic foreboding, such as the birth of Hitler or the invention of the gatling gun, a direct juxtaposition of the creative and the destructive. Just as Munch rejected naturalism for expression, Watkins deliberately disrupts drama-documentary conventions with a broken mirror approach to editing, cross-cutting between locations, characters and timeframes to occasionally disorientating but often hypnotic and always purposeful effect. Scenes set in the narrative present are peppered with images of childhood sickness and Munch's failed relationship with Mrs. Heiberg, twin traumas that were to haunt the artist's early years and work, while the underlying linear passage through the most crucial years of his artistic development can switch in an instant from the observational to a detailed analysis of how a particular painting was constructed. The soundtrack is at times similarly complex, particularly during the cross-cut sequences, two of which are dominated by the sound of Munch weeping, a subjective veil of despair that encompasses everyone and everything even indirectly connected to him. It's fascinating, information-packed viewing and it needs to be – at three-and-a-half hours in length, with only the voice-over delivered in English and a fair amount of (carefully selected) image repetition, the film is almost a gift for rejection by the more intolerant viewer. 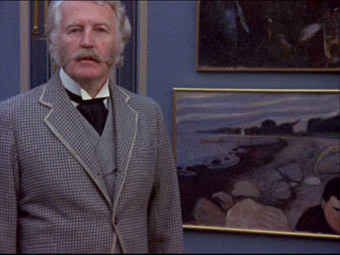 But if you're serious about cinema and about art, then Edvard Munch is an outstanding must-see, a film that really does redefine the terms by which subsequent and future biographical documentaries should be judged. Framed in its original 1.33:1 ratio – the film was originally created for TV screening – it's easy to spot the 16mm origins, particularly in the ever present film grain, though this varies enough to make me wonder if different film stocks weren't used for different sequences. Contrast, colour and black levels also vary – for the most part they are very good but in places are a little washed out, but again this could be a deliberate artistic choice. Within the restrictions created by the original material, this is a generally very decent transfer. The Dolby 2.0 mono soundtrack has a trace of background hiss, but you'll rarely hear it. For the most part this is a clear, clean track that showcases Watkins' expressive sound montages well enough. There are none on the disc, and given the length of the film and Watkins' own refusal to be interviewed by a third party, that's hardly surprising. This matters not, thanks to the excellent Booklet that accompanies the DVD, which contains a wonderfully detailed essay on the film by Joseph A. Gomez, a typically revealing self-interview by Watkins, notes on the restoration by Oliver Groom and a useful timeline of Munch's life. I'd go as far as to suggest that the information packed into this booklet actually surpasses what most commentary tracks could deliver. I've waited a long time to see this film, long enough to build up some unreasonably high expectations, but Edvard Munch lived up to them and delivered a fistful of surprises on the way. As someone who thought he knew about this particular artist I found that I still had much to learn, about Munch himself and particularly about the social and political situation in Norway of the period. Not an easy entertainment by any means, it's still a hell of a film, and further proof, if needed, that Peter Watkins is one of this country's most important and innovative filmmakers, and yet still one of it's most criminally undervalued.